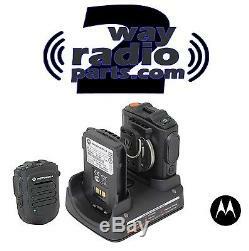 Genuine Motorola RLN6554A Wireless Remote Speaker Mic Kit for APX Radios. OEM Motorola part # RLN6554A. Kit includes: 1 x Wireless RSM mic, 1 x RSM batttery, 1 x Dual Charger and 1 x Swivel Clip. Featuring enhanced security, quick pairing, and fast PTT capabilities, the wireless RSM helps you work safer, smarter and more comfortably in demanding environments The RLN6554A RSM has a Large, but recessed push-to-talk and emergency buttons to ensure that users have easy access to controls, but don't have to worry about accidental activation. The added Task Light allows you to read driver's license in the dark. APX 1000, APX 3000, APX 4000, APX 4000 Li, APX 6000, APX 6000 Li, APX 6000 XE, APX 7000, APX 7000 XE and APX 8000. Not compatible with MotoTRBO XPR7550 portables. 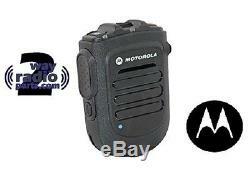 Not compatible with MotoTRBO XPR5550 or XPR4550 Mobiles unless a Mobile BT Gateway mic is used. Your radio must have or be equipt with a Internal Bluetooth Module Board.. Installed and active with a supported firmware flash. Check your radio specs with your radio technician before purchasing. This Item is very new and stock may be limited at times.. These are brand new ORIGINAL MOTOROLA parts. All our parts are ordered factory fresh, these have NOT been sitting around. At 2WayRadioParts we are committed to bringing you the Very Best... 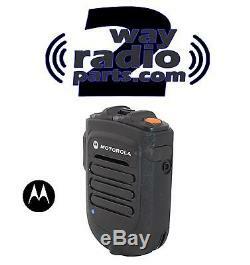 Check us out online (2WayRadioParts com) for the best deals in the World on Motorola Parts and Accessories! The item "Motorola RLN6554A Bluetooth Wireless Remote Speaker Mic KIT APX6000 APX7000 New" is in sale since Sunday, March 8, 2015. This item is in the category "Business & Industrial\Facility Maintenance & Safety\Surveillance & Alarm Equipment\Two-Way Radios". The seller is "2wayradioparts" and is located in Racine, Wisconsin. This item can be shipped to United States, all countries in Europe, Canada, Japan, Australia.